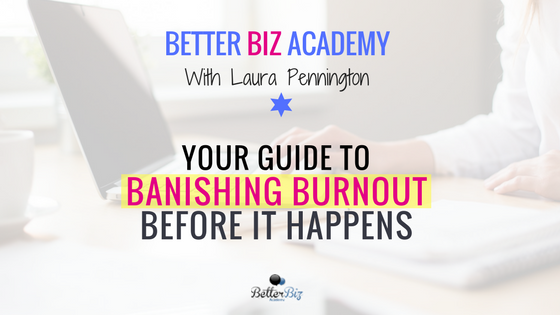 Burnout is one of the most explosive things that can happen in your business and it can bring things to a sudden and screeching halt, as you watch your income dwindle to zero when you find yourself suddenly and unexplainably unable to do anything. Burnout is a serious conundrum in the online entrepreneur community today because we are constantly bombarded with advertisements promising the benefits of hustling 24/7, never giving up, taking on more and more projects etc. I have fallen victim to near burnout several times and have had to walk myself back from the edge of the cliff of feeling like I didn't even want to be in business anymore. In many cases, we bring ourselves to the brink of burnout and it's our own fault that we find ourselves in this situation. We're suddenly, completely and totally exhausted, both physically and emotionally. You feel like you don't even want to show up to do anything within your business, and you find yourself not caring about the pertinent decisions that need to be made. You'll find yourself on the edge of burnout, very suddenly. It might have been creeping up for weeks or months at a time, but there may come a day when you literally just can't imagine doing one more thing or showing up to answer the emails in your inbox. Your goal is to avoid this situation before it happens and walk yourself back from the brink of burnout, before you reach full on burnout mode. I can't tell you how many successful entrepreneurs I have talked to who lament the loss of thousands of dollars or months spent building their business, because they had a complete breakdown and needed to take 100% of the time off. I'm talking very successful, multi-six figure and million dollar entrepreneurs, who just one day were unable to do it at all anymore. It took them 3-6 months or even longer to come back to being focused on their company. This could be detrimental to your physical and emotional health in addition to your family and your finances. Identifying burnout early, before it gets to the point of exhaustion is extremely important because you could find yourself sick. The human body has a way of absorbing stress and workaholism up to a certain point, until it reaches a breaking point, at which you are no longer able to handle even the most minor of tasks. You're saying yes to every client who wants to work with you. You find yourself wrapping up days late into the evening with plenty of items still on your to do list. You've outsourced everything you can possibly think of, but still find yourself overwhelmed. You suddenly find yourself getting sicker, developing colds or experiencing headaches that you didn't before. These are all early clues that you could be headed towards burnout. If you're like me, you might be saved by another successful entrepreneur who virtually grabs you by the shoulders and says, "hey, if you don't stop what you're doing now, you are going to burnout and crash." This happened to me several months ago when I had my business causing me to work hour after hour after hour, in the midst of moving to a new town, setting up a new house, dealing with a difficult landlord, planning a wedding and handling the general responsibilities of life. One of my mentors told me “I've been there and I've lost over a hundred thousand dollars from burnout. Stop it before it gets there. End your smallest contracts immediately, outsource everything you can." This is not about the money, this is about clearing your plate. Since then, I undertook a strategy to remove as much as possible from my plate by giving it to qualified team members, scaling back on the number of new materials or content being produced and simply keeping a smaller and leaner schedule. Working with a handful of clients on high volume projects, for example, means that I don't have to divert my attention in too many different directions. I know what I'm responsible for every month. Yes, my income has gone down because of this but my stress level has also decreased. Being aware of burnout and recognizing that you are taking on too many projects or have taken on too many responsibilities is crucial. You need to tap into your support network as soon as possible. This could be virtual assistants, friends or family members. Any projects that you absolutely do not need to be working on, and I mean literally anything other than serious commitments that pay your bills, needs to be axed or handed off to someone else right away. You will feel a world of difference when you start to get things off your plate. It is very difficult to break up with clients in this situation or to trust your services - the services you've had a track record of providing to someone else. But you're saving your health in the meantime. Don't push yourself to the point of burnout. I can't tell you how many emails I get per week from experienced entrepreneurs who have all the way through a burnout and almost collapsed and had to file bankruptcy or close their business because of it. The sooner you can recognize that you've got too much responsibility, the sooner you can take actual steps to stop it. If you are a person who tends towards burnout, be aware that you may not encounter it just once in your lifetime; it may come up again and again.